Ã‚Â· Java Runtime Environment 1.4.2_06 and Visual J# .NET 1.1. Logically Citrix has added this source within the installation package and no reboots are required for these installations. The in MPS3 introduced license is logically needed for your environment. This version of the License server now supports Microsoft Clustering and also can be installed on a Apache webserver. Further if you are already familiar with the installation of Citrix Presentation Server nothing new will be shown to you, although the way and order it is presented is changed a little bit. 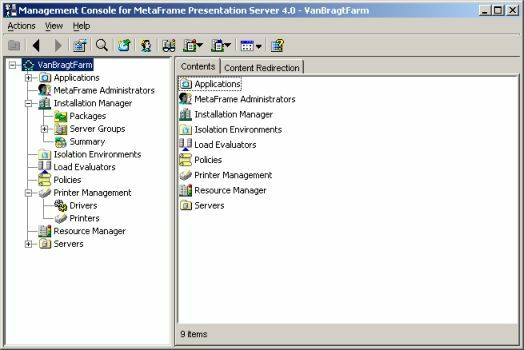 Of course you need to choose which version of Presentation Server you want to install (see for the differences between the versions this knowledbase article), followed by choosing the create or join a farm. If installing the first server you select the Create Farm option. Choose the database you want to use (the same databases options as in earlier versions like PS XP and MPS3), specifying the administrator credentials, choosing the license server, specifying the shadow options and choosing the XML port. When joining a farm you almost need to fill in the same options, except that you just choose the database type which you have chosen during the creation of the farm (when installing the first farm). Citrix also did not change the possibilities to install the product via a unattended install with a lot of parameters, so this is still satisfying. 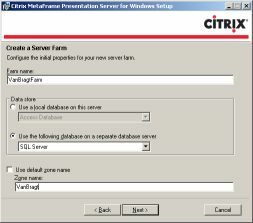 Nothing changed to the way to configure the Citrix Farm. The Java bases Presentation Server Console, the Citrix Connection Configuration Utility and also the in MPS3 introduced Access Suite Console still exists. I am wondering if Citrix hold their promise to get rid of the Java Presentation Server console. All the new and existing features can be configured and managed within the Presentation Server Console. First take a quick look at the features which were also available in earlier versions of Presentation Server. Citrix did not change anything on the load balancer. It is a pity they did not repaired some design mistakes. But it is still (one of) the best load evaluators in a SBC related product. Resource Manager has also no new features in it. Is is exactly the same as in the previous version. Also no big changes to the Installation Manager component. A new tab is introduced called summary. On this tab you can watch which programs are installed out of which package and a job overview. Unfortunate the status messages are exactly the same as in the previous versions. The policies are extending in every new version of the Presentation Server product. 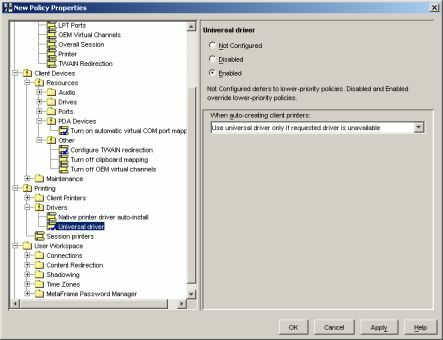 This time Citrix has added again a lot of new policies and moved some setting from the console to the policy settings. For example the way the printer driver is selected (native, universal) is now (only) available in the policies. Also lots of new features can be enabled through the policies like the TWAIN support for the scanners and the PDA synchronization. Also the bandwidth settings are extended and as mentioned earlier the printer driver settings are moved to the policies. Within the CPS4 settings is now also possible to configure the permissions which may shadow the end-users and settings for Citrix Password Manager can be configured. Let's take a look to the new features which are available in CPS4. These new features have been already mentioned above. The configuration of the TWAIN and PDA support only exist in enable the feature within the policies. Citrix changed the printer subsystem completely. There is new Universal Printer driver based on EMF EMF jobs are not rendered on the server, the jobs are smaller and EMF is native Windows format. Also Citrix created a special service for handling all printing related task. To handling printing in such a way Citrix is approaching third party products like Thinprint, Tricerat and Uniprint. When using auto-created client printing Citrix now pulls the local printer setting (like papersize and trays) of the client and configures them to the printer on the Terminal Server. Also Citrix simplified the the naming structure of printer objects be more user friendly. The printer name will now show up with the same name as it is defined on the client. As mentioned before the configuration and management all CPS 4 printing options will be configured via Citrix policies instead of at the farm level. This means that youÃ¢â‚¬â„¢ll be able to granularly control which types of users and connections use which type of printer options. At BrianMadden.com a nice article can be found with detailed information about the printer subsystem. Within CPS4 Citrix introduced CPU and Memory optimization. Citrix did not developed this by their self, but licensed these two features from other manufacturers. The CPU workload management is licensed from Aurema, while the virtual Memory optimization is licensed from RTOScale. Logically these features are stripped of version of the standard products of these manufacturers. You can just simple enable or disable these optimization settings within the Citrix Console on server and farm level. With Isolation Environment it is possible to isolate one or more applications from the physical server. The principle of this technique is pretty the same as Softricity's Softgrid, except this isolate environment is local on every terminal server (and not maintained on a special server) . By virtualizing applications you can avoid conflicts that applications can have with eachother. Within the Console you create one or more isolated environments. Within this environments you can then install one or more applications where the file and registry keys are stored in their own sandbox. Citrix did a good job with this feature, they embedded it through the complete console. You can install applications via IM in an isolated environment, you can publish applications via the wizard in an isolated environment and so on. But Isolation Environment is not a replacement of Softgrid, you can see it as a simplified version of application isolation in comparison with Softgrid. Rodney Medina wrote a nice article about this feature, you can read the article on BrianMadden.com. Managing your Citrix environment is still be done via the Presenation Server Console and the Access Suite console. Both are not changed a lot. De Presentation Server console has only some added new features. Within the Access Suite console their are just a few minor changes concerning the license server and the diagnostic tool. The report centre is extended with more reports templates and is still the most valuable option within this console. I would really love to see to move all management and configuration to one console. Shadowing is still wonderful and off course Citrix support with the plug-ins HP Open View, Tivoli and MOM. Presentation Server 4.0 is huge step forward in Server Based Computing technology. Finally long wanted features like Twain support, PDA support, Windows key mapping and much more are implemented. New cool features are available like Isolated Environments, new Printing system, and Smartcard extensions. Citrix improved the complete product also with faster logons, more users and faster access to client devices. Citrix shows why they are the market leader in the SBC market. The competitors which came close to earlier versions have again some work to do.